The only program of its kind, Young Artists of America at Strathmore presents symphonic theatrical productions featuring young performing artists from the Greater Washington, DC area alongside professional mentors. Young Artists of America at Strathmore (YAA) trains high school and middle school level performing artists in collaboration with leading, professional artists to present fully-orchestrated productions at state-of-the-art venues, like our home stage at the Music Center at Strathmore. The premier performing arts training organization in the region, preparing students to take the stage. With campuses around the Washington, DC area, Young Artists of America at Strathmore (YAA) works with high school and middle school level performing artists every step of the way to provide them with performing arts training programs and opportunities. From our one-of-a-kind Mentorship Program with leading professional artists, to essential performing arts classes that include music (vocal and orchestral), dance, and acting training, to performance opportunities at state-of-the-art venues like our home stage at Strathmore, we offer a unique experience like no other in the nation. We are thrilled to be part of the 2017-18 Catalogue for Philanthropy, and to be recognized as one of the best nonprofits in the DC Metro region. Founded and led by brothers Rolando and Kristofer Sanz, Young Artists of America at Strathmore’s goal is to provide gifted and committed students unique performance and educational opportunities in a professional, nurturing and collaborative environment. Train for two weeks with the region’s top performing arts faculty in a rigorous, inspirational, summer camp experience. Choose either our daytime Academy or overnight Conservatory to learn technique, increase confidence, and grow as a performing artist this summer! YAA's Summer Performing Arts Intensives for middle and high school students in the Washington, DC area are one-of-a-kind, summer camp experiences. Our students (rising 6th-12th graders and rising college) train for two or four weeks with the region’s top performing arts faculty in a rigorous and inspirational environment! Whether you're interested in Acting, Dance, Voice, or A Cappella (new in 2019) -- or some combination of these disciplines-- YAA’s Summer Performing Arts Intensives in Montgomery County, MD can be tailored to your interests in a summer camp experience. Check out our blog to stay up-to-date! 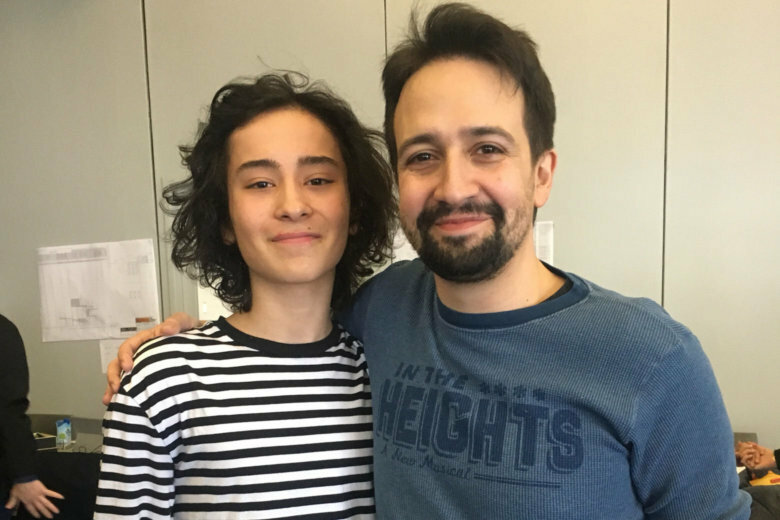 YAA Student, Mateo Ferro, with the visionary Lin-Manuel Miranda, while in rehearsals for the Kennedy Center's production of IN THE HEIGHTS. YAA Student, Sam Nasar, performs on stage with musical legend, Michael Feinstein at Strathmore. Our production won an EMMY Award at the Regional EMMY Awards on June 23rd, 2018! We chat with YAA Alum, Chani Wereley about what it’s like to be a professional working actor. Our one-of-a-kind Mentorship Program brings professional performers from Broadway and around the world to work with our students. Mentors Kristen Chenoweth and Mary-Micchell Campbell with our students after performance. The cornerstone of Young Artists of America at Strathmore is its unique Mentorship Program where students work alongside major leading performing artists from national and regional stages as well as leading university programs. Past mentors have included Kristen Chenoweth, Stephen Schwartz, Jason Robert Brown, and more. Learn about our recent mentors as well as Masterclasses and Workshops with current mentors. We have set an ambitious goal to raise $40,000 by the end of 2018 and we need your support. Your donation is fully tax-deductible and will be matched dollar for dollar up to $20,000 thanks to our angel donors! If you would like to invest in our mission of providing the youth in our community with powerful musical opportunities — filled with artistry, excellence, and mentorship — we invite you to join our “I DREAMED A DREAM” fundraising campaign going on now until the end of the year! Reach out to us anytime by phone, email or social media! We want to hear from you!